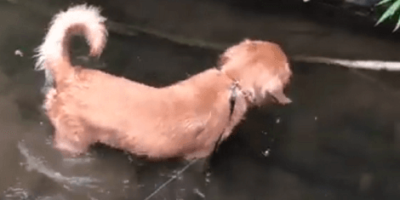 What Happens When An Adorable Pups Gets To Go To A Small Pond?! The water is a lovely place to splash around in on hot days – and when you are an adventurous pup who wants to explore and discover new locations, a unique pond may catch your attention! This man-made set of tiered ponds controlling the water flowing down a shallow slope certainly has caught this pup’s notice. Not content with just splashing around in a single, small pond, this Golden Retriever puppy is curious to see just where all these ponds lead to! Thus he begins his slow, careful ascent upwards, as he does his best to make it over the small falls that have been created. It seems that there isn’t much else up here, but this pup is proud of himself all the same. After all, it was a fair bit of work, and he has accomplished something he had set out to do! Quite the inspiration, if you asked us. No Matter What Anyone Says, This Adorable Pup Still Doesn’t Understand Waves! Just How Good Is Your Pup’s Nose? This Footage Is Going To Leave You Speechless!